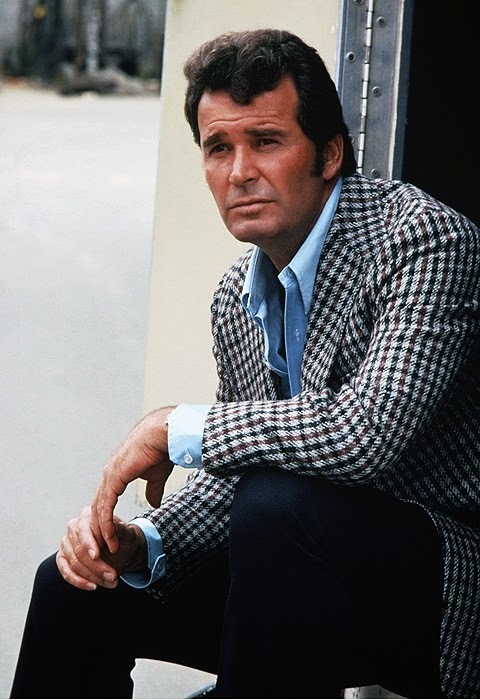 Raise your hand if you've had the theme to the Rockford Files playing in your head all day on the news of James Garner's passing? I associate Garner, and especially the Rockford Files, with happy family life because for years we'd barely see my dad from Tuesday-Thursday as he "put the paper to bed," but on Friday night he'd be home and we'd have dinner in front of the T.V. to watch Rockford together. If Rockford was on, then Dad was home and all was right with the world. Mom was enjoying her eye candy and Dad was getting a kick out of Rockford's rumpled fight for justice and the juicy-delightful cowardice and betrayal of his erstwhile sidekick, Angel. I had a crush on Rockford, of course, but I also recall loving the father-son relationship between Rockford and his dad, Rocky -- their crusty, undemonstrative tenderness for each other. Did any actor ever play annoyance, chagrin, reluctance or wheedling a favor to such comic effect? Until very late in life the man had the most pliable face in show business. I don't actually know much about him beyond his being a self-proclaimed "bleeding heart liberal" and having a long-lasting marriage, which is always impressive in Hollywood. I thought about reading his memoir when it was released, but was afraid it would cool my affection for him. Here's the Variety review of his career.